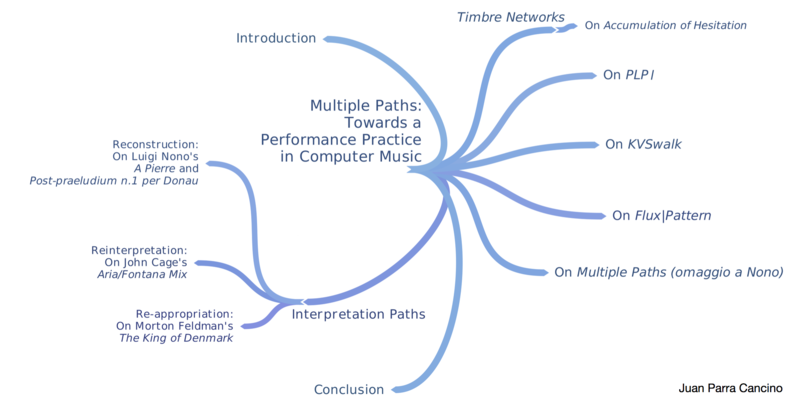 A project by Juan Parra C.
This research project proposes multiple paths towards the development of a performance practice in computer music. It starts with the author’s transition from traditional instrumentalist to electronic musician, assessing the roles of composer, performer and instrument builder as integrated in computer music practice. Three of the case studies presented in this thesis suggest approaches to understand the notion of interpretation with electronic instruments, introducing the methods of reconstruction, reinterpretation and re-appropriation as applied to the performance of music by Cage, Feldman and Nono. The remaining five case studies deal with the author’s own creations, developed on the basis of concepts such as mapping, sonification, historical contextualisation and spatialisation, and informed by the multithreaded role of the computer music practitioner. The situation of the performer of electronic instruments in relation to traditional instrumentalists is a topic of consideration throughout this thesis, informing the final conclusions as well as refuelling the questioning for future work.